As much as we’d love to say the Lexus ES is a worthy rival to the BMW 5 Series, Audi A6 and , the truth is the Lexus likely won’t appear on the radars of people who prefer the offerings of the premium marques. On top of being notably less prestigious than the aforementioned German marques in the eyes of the more brand-oriented buyer, there’s also a massive gulf in the pricing of these cars: even the most affordable of the German executive trio, the Audi A6, is nearly $9,000 more expensive than the Lexus ES. Not that this won’t stop us referring to the premium options in this review, though. After all, the Lexus ES and those German sedans are technically in the same class of car, and – as we’ll discuss throughout this review – the Lexus ES comes across as a vehicle that can do most of what the higher-end cars can do whilst being noticeably cheaper to buy. The Lexus ES is rather impressive when it comes to interior space. Being quite a sizeable vehicle for this segment, the Lexus ES is rather impressive when it comes to interior space. Cubby spots like the door bins and glove box are of a useful and decent size, and the trunk capacity of 15.2 cubic feet on the regular model is pretty good by class standards too. Better still, the trunk itself is broad and boxy, and is further aided by the wide opening and the shallow-by-sedan-standards load lip – , if you need more room, the 60:40 split-folding rear seats fold away almost completely flat. What really impresses about the Lexus ES’s cabin, though, is the sheer volume of the passenger compartment. Though we still feel there’s a bit more room overall in the , the Lexus ES still has plenty of space available in the front and back seats, with enough room to accommodate taller drivers and passengers. Plus, as the Lexus ES is front-wheel drive, there’s no transmission tunnel running down the length of the car, meaning the passenger using the middle seat in the back row has a good amount of room to place their feet (a luxury that wouldn’t be provided if you went for any of the other mid-sized executive sedans on the market right now). Sadly, the ES Hybrid model doesn’t quite fare as well as the regular sedan in the practicality sweepstakes. Build quality’s also rather good considering its price point. For sure, the likes of the Audi A6 and Mercedes-Benz E-Class won’t need to worry, but the overall fit and finish is still rather satisfactory considering the vehicle’s base price (the Lexus ES is superior by a noticeable margin to premium vehicles from the lower class, ). Our only criticism, in fact, is the slightly fussy button layout on the center console that, on top of betraying the vehicle’s age, isn’t particularly intuitive to operate initially. Sadly, the ES Hybrid model doesn’t quite fare as well as the regular sedan in the practicality sweepstakes, with the most obvious example of this being the versatility of the trunk. Due to the location of its battery packs, though, the hybrid Lexus ES sadly only has 12.1 cubic feet to play with, which makes it one of the least spacious cargo areas you’ll find in this class (the Cadillac CTS, a vehicle that already has a tiny-by-class-standards trunk, has a capacity of 13.7 cubic feet). You also don’t get folding rear seats on the Hybrid, so the tiny trunk’s all the space you have available if you’re fully loaded up with passengers. Such attention to dynamics, though, wasn’t prioritised in the development of the Lexus ES. Lexus has, over the last few years, made decent strides towards making its cars fun to drive. On top of building sporty performance models and even a limited-run supercar, Lexus has also worked hard to make models like the IS and GS sedans, as well as the , engaging vehicles to navigate down a road. Such attention to dynamics, though, wasn’t prioritised in the development of the Lexus ES. As a result, if you’re the sort of buyer who craves controlled body lean when cornering, sharp responses and even just decent feedback through the steering wheel that gives you an idea of what the front wheels are doing, the Lexus ES won’t appeal to you in the slightest. If comfort’s a main priority for you, though, then the Lexus ES will appeal to you immensely. 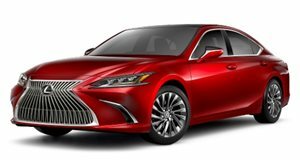 The ride quality in particular is especially impressive, to the point where we’d say few vehicles in the mid-sized sedan segment can trouble the Lexus ES’s ability to filter out imperfections in the road surface. The Lexus ES does suffer a bit in terms of rearward visibility. Likewise, noise insulation levels are pretty good too, with the marginally intrusive tire roar at higher speeds or rougher road surfaces being the only noteworthy detriment to the Lexus ES’s serene attributes. As with a majority of the vehicles in this segment, the Lexus ES does suffer a bit in terms of rearward visibility, as a result of thick rear pillars. Thankfully, forward visibility is decent, and the reversing camera does help alleviate some issues, but it’s a shame you need to spend a couple of thousand dollars or so just to specify the blind spot monitoring system that would help rectify this issue the most. Normally, mid-sized executive vehicles with larger engines aren’t usually that efficient – and especially in comparison with the latest crop of cars with smaller, turbocharged units. Not so much in the Lexus ES, though: whilst it’s not exactly class-leading, the base powertrain is still frugal enough to satisfy the needs of most buyers. With claims of 21mpg in the city and 30mpg on the highway, the Lexus ES’s 3.5-liter six-cylinder gasoline engine is decent by mid-sized sedan standards, if admittedly down on what the more efficient six-cylinder examples in this class can manage (in its most efficient guise, the can return 21mpg in the city and 34mpg on the highway). If it’s the best fuel economy you want, though, then the gasoline-electric hybrid’s the powertrain for you. With claims of 39mpg in the city and 40mpg on the highway, the ES Hybrid is on paper amongst the most efficient vehicles in this segment, with even diesel versions of the Mercedes-Benz E-Class and struggling to match the combined economy rating of the ES Hybrid. It’s worth pointing out, though, that the ES Hybrid’s sizable premium over the regular version does mean you’ll need to rack up lots of miles or own the vehicle for a longer period of time in order to justify the extra outlay. Regardless of which powertrain you opt for, you’ll have a refined and fairly potent system at your disposal. Regardless of which powertrain you opt for, you’ll have a refined and fairly potent system at your disposal. Though the six-cylinder engine has more power than the 2.0-liter four-cylinder/electric motor setup, the fairly good torque outputs mean both engines don’t need to be worked too hard in order to get the Lexus ES up to speed. Better still, both engines are well suited to cruising about at lower revs, which suits the Lexus ES’s more relaxed, comfort-oriented character. We would prefer a slightly tweaked transmission, though. Though the six-speed automatic is fine enough, with quick and smooth gear changes, it’s not the pinnacle of automatics in the mid-sized executive sedan sector. The fact it ‘only’ has six gears, in a sector that’s quickly adopting transmissions with seven, eight and even nine forward ratios, means there’s less of a chance of keeping the engines at their optimum cruising rev range. Still, the transmission does do a good job at selecting the most appropriate gear possible – even though we would lavish more praise onto the automatic if there were more gears available in the ‘box. The Lexus ES comes with a decent amount of equipment as standard. As comfy, refined and (in some instances) extremely frugal the Lexus ES is, the true calling card of this mid-sized sedan is its value proposition. So much, so, that even a fully loaded example can retail for less money than an entry-level Mercedes-Benz E-Class – and even then, you’ll need to spend thousands of dollars on options just to match the spec level of the maxed-out Lexus. Despite the $38,900 starting price for the base 3.5-liter model (or $41,820 for the Hybrid), the Lexus ES comes with a decent amount of equipment as standard. Dual-zone climate control, power-adjustable front seats, radar-guided cruise control, lane departure warning, a reversing camera and a complement of 10 airbags all come fitted to ever Lexus ES, which is pretty good considering said features are optional extras on some more expensive competitors. As with many cars of this type, though, the options list can make things rather difficult to wrap your head around. This is especially the case when you’re looking at specifying base features: for instance, in order to specify the $500 blind spot monitoring system, you’ll need to spend another $500 on front and rear parking sensors, and over $1,000 on the Premium package (it’s officially listed as $730, but it’s only available if you specify a $300 leather-and-wood steering wheel). The Lexus ES is at its sweet spot when you keep it as close to the $40,000 mark. This all means it’s incredibly easy to spend lots of money a Lexus ES if you’re not too careful. For sure, as we mentioned earlier, you can fit loads of equipment in an ES whilst still undercutting like-for-like rivals, but the Lexus ES is at its sweet spot when you keep it as close to the $40,000 mark as possible. Just because you can buy a pleasantly-equipped Lexus ES in the $45,000-$50,000 ball park doesn’t necessarily mean you should – mainly because, if you want a spacious and well-appointed Lexus sedan at that price point, we’d be more inclined to recommend the base Lexus GS over the ES. Regardless of how many options you do or don’t decide on having on your Lexus ES, you will still have a very safe and reliable car. On top of the aforementioned airbags, a complement of stability systems and a pre-collision system that’s able to autonomously apply the brakes at sub-24mph speeds if it detects an obstacle ahead are fitted to the Lexus ES as standard, and the sedan also has amongst the highest reliability ratings for a vehicle of its type. That strong sturdiness record explains why residual values are strong by class standards, too.